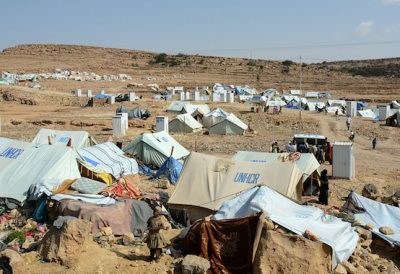 Coalition attacks and a blockade on fuel and other supplies have left civilians in Houthi areas more vulnerable to cholera, and less able to get antibiotics and other life-saving help than those in other parts of the Arab world’s poorest nation, he said. “Aside from the devastation from air strikes on hospitals and clinics, the health emergency in Yemen has been made significantly worse by Saudi restrictions on petrol imports, leaving the remaining health centres without power,” Venters said. The coalition blockade has also been a major factor in creating near-famine conditions in the same areas, and that makes the malnourished more susceptible to disease. Because malnourished children in particular are much more likely to die from disease, the coalition war and blockade are threatening their lives in at least two ways. This is another reminder that the multiple, overlapping humanitarian crises in Yemen did not just happen accidentally, but were produced as a result of the coalition’s targeting of civilian targets and infrastructure along with the deliberate effort to starve Yemenis into submission. The “weaponization of disease” that Dr. Venters refers to has now created the world’s worst cholera epidemic that has already infected well over half a million people in the span of a little over four months. Featured image is from UN OCHA/Philippe Kropf, via Flickr.